In cinema, you don't get a much more loyal fan base than former MN Governor Jesse Ventura reportedly asking the Dalai Lama if he'd seen Harold Ramis' contemporary comedic cult classic Caddyshack. Additionally, as Tea Leoni shared, the work-- which was released by the now defunct, "name only" American independent studio Orion Pictures-- was the very first film she viewed with her future husband David Duchovny. Simply put, Caddyshack, has only grown in popularity over the years. And with the box office success and reverence for its original cast, comprised of some Saturday Night Live alumni including Chevy Chase and Bill Murray along with The Mary Tyler Moore Show's own Ted Knight, the film hit audiences in 1980 at precisely the right time. Namely, the feisty battle of "The Snobs against The Slobs" along with one tenaciously fierce little gopher at Bushwood Country Club that helped unconsciously foreshadow and usher in the subtle blue collar battles of the decade from the teen comedies of John Hughes (Pretty in Pink, The Breakfast Club, Some Kind of Wonderful) to Oliver Stone's Wall Street. Fittingly, now in time for its anniversary, marking twenty-five years after Rodney Dangerfield first implored, "let's dance," the ten song soundtrack makes its official CD debut in a limited edition run of just 3,500 unites from La-La Land Records and Sony Music Entertainment. 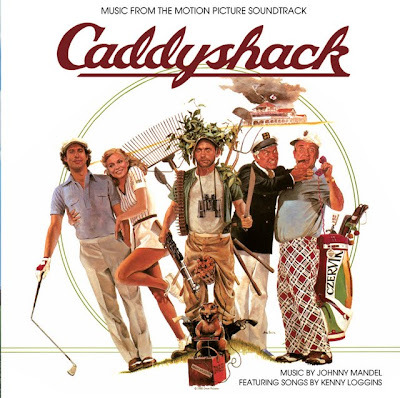 And because the hilarity and off-the-wall characters along with their definitive one-liners is mostly what we remember when somebody says Caddyshack to us, I was startled to realize just how great the music was in this soundtrack that was sent to me for review on behalf of the labels. Obviously, most fans remember the opening sequence with the dancing gopher (see above), which undoubtedly would've been scrapped or replaced with CGI perfection today set to the rhythmic magic of Kenny Loggins' theme song "I'm Alright." Yet I'd forgotten just how many other songs Loggins (aka the voice of the '80s with Footloose, Top Gun etc.) had contributed to the film that all combined together to establish the film's theme and moral to be true to yourself... no matter how wealthy or wild you may be, which was best evidenced in the character of Rodney Dangerfield's eccentric "new money" golfer. Journey's "Any Way You Want It"
-- Rodney Dangerfield: "Let's Dance!" Still, despite the wonderfully catchy Journey song, "Any Way You Want It," that remains the epitome of an '80s soft pop power ballad, it's the tunes by Loggins that lend a sense of unexpected heart to the movie along with the contributions of original score composer Johnny Mandel, best known for his creation of the theme from M*A*S*H.
A few exceptions aside with other guest artist inclusions like The Beat's download worthy "There She Goes" and Hilly Michaels' bizarre and very '80s "Something On Your Mind," it's Loggins and Mandel that fill out the brisk, roughly thirty minute running time of the soundtrack. The album easily moves from paying homage to both Richard Wagner's Ride of the Valkyries and channeling its pop culture shorthand of "the scene from Apocalypse Now" in a nice musical spin titled "Divine Intervention," to more radio friendly hits by Loggins including what seemed destined to become a figure skating favorite track in the romantic hook-heavy "Lead the Way." With a terrific sound selection, it's a nice eclectic mix for Caddyshack cultists and soundtrack collectors. And now that it's back after years of being out of print in other formats in a nice CD vintage (making it slightly retro since it's sans a digital component), the Limited Edition status fits the Members Only mentality of Bushwood. Therefore, to turn Chevy Chase's advice as Ty Webb around, instead of trying to "be the ball," "be the soundtrack" while it's still available and before the 3,500 total number of people discover how fun it is to dance.